I bet you can relate to this – when something bad happens in my life, I often wonder why this is happening? What’s the purpose? I have learned to get very close to God during these times and ride out the storm – not knowing why this had to happen to me. Then 2 years, 5 years, 15 years later, someone walks into my life who needs to hear about that specific time in my life and how God helped me through it. Paul tells us this is going to happen in 2 Corinthians 1. 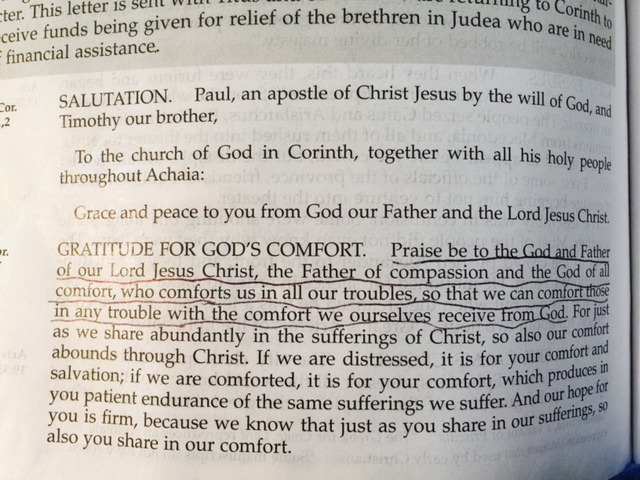 We receive comfort from God in our troubles so that we can comfort others. God has a purpose for everything that he permits to happen to us. Everything flows through his hands into our lives. As we learn to trust him more, we can be confident in the knowledge that God is in total control. We know God. He loves us. He has a plan for us. He wants the best for us.